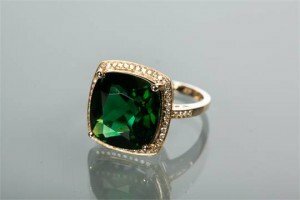 A Green tourmaline and diamond cluster ring, the central cushion cut green tourmaline approximately 8 carats, surrounded by brilliant cut diamonds and on brilliant cut diamond shoulders, the diamonds totalling approximately 0.60 carats, marked for fourteen carat gold. 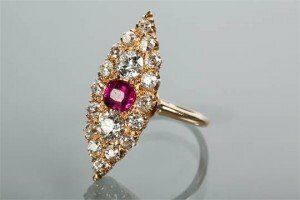 An impressive marquise shaped diamond and ruby cluster dress ring, the central emerald cut ruby, surrounded by a cluster of brilliant cut diamonds, in fourteen carat gold. 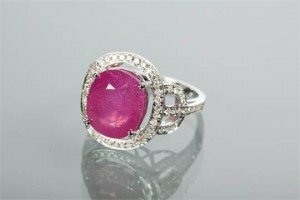 A ruby and diamond cluster ring, the central oval ruby approximately 9 carats, surrounded by a row of brilliant cut diamonds, on trifurcated diamond set shoulders, the diamonds totalling approximately 0.75 carats, marked for fourteen carat white gold. 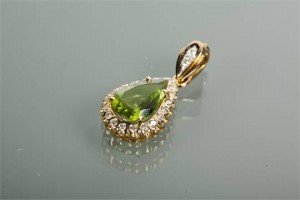 A peridot and diamond pendant, set with a large central pear cut peridot, surrounded by a row of brilliant cut diamonds, suspended from a diamond setting. 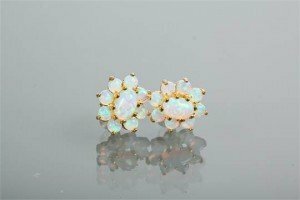 A pair of synthetic opal cluster earrings set with clusters of oval and round synthetic opals, in silver gilt. 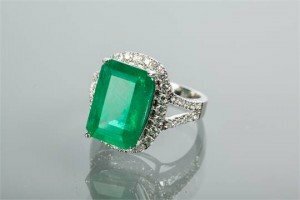 An emerald and diamond ring set with an emerald cut emerald, surrounded by a crow of brilliant cut diamonds, on diamond set bifurcated shoulders, in eighteen carat white gold. 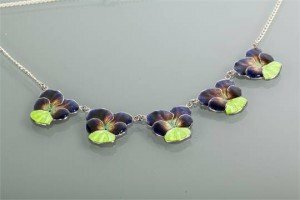 An arts and crafts silver and enamel pansy necklet set with five pansies enamelled in blues and greens, marked silver, on a silver chain. 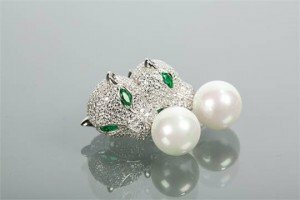 A pair of silver gilt tiger motif drop earrings, each modelled as a tiger, pave set with white and green gemstones, with a pearl effect drop, in silver. 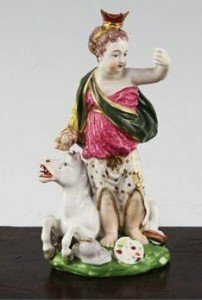 A Derby porcelain group of Britannia, late 18th century, standing beside a figure of a white horse with items at her feet emblematic of Industry, The Arts and Literature. 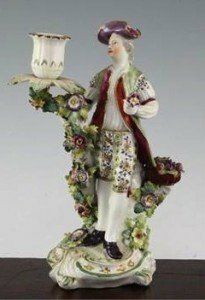 A Derby porcelain candlestick figure, late 18th century, modelled as a gentleman holding a posy of flowers and a basket of fruit beside him and a flower encrusted branch supporting a nozzle with petal shape surround. 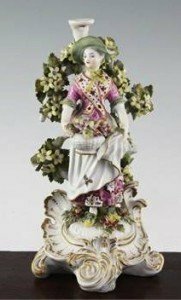 A Derby candlestick figure, c.1770, modelled as a lady holding a basket of flowers in her apron standing before bocage, on a gilt highlighted scrollwork base, pad marks. 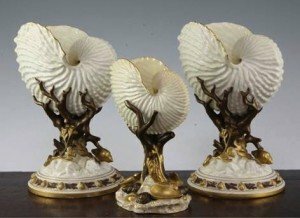 Three Royal Worcester ‘nautilus shell’ vases, late 19th century, comprising a pair and a smaller example, the nautilus shell bowl raised on a seaweed shape stem and a domed base encrusted with shells, puce and green printed marks. 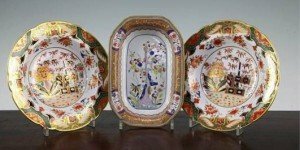 A Spode stone china ‘Tree of Life’ pattern dish and two Spode bone china ‘Japan’ pattern bowls, early 19th century, the pair of shallow bowls with barbed rims with rich Japan patterns. 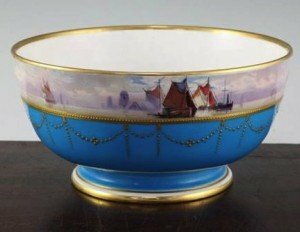 A Minton bleu celeste ground bowl, painted by James Edwin Dean to the upper band with sailing ships in estuary, above gilt dot swags and a bleu celeste ground. 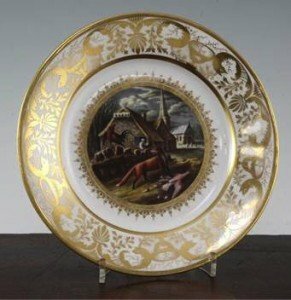 A Derby plate, early 19th century, painted to the centre with a fox attacking chickens, an angry farmer looking from the window of his cottage, a church beyond, circular reserve and gilt grotesque bird and urn anthemion and leaf border. 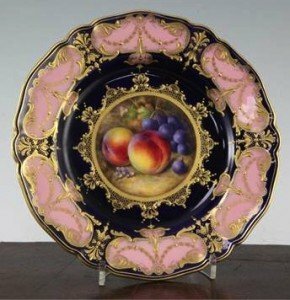 A Royal Worcester fruit painted cabinet plate, by Richard Sebright, date code for 1937, the centre painted with peaches and grapes within a gilt circular cartouche on a cobalt blue ground with pink reserved and gilt decorated borders. 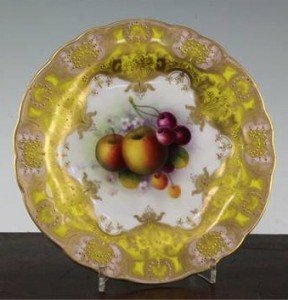 A Royal Worcester fruit painted cabinet plate, by A. Shuck, date code for 1920, painted to the centre with apples, cherries and blossom within yellow and gilt foliate and shell decorated borders. 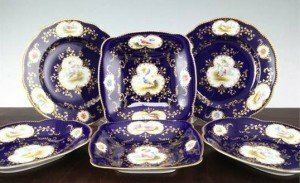 A Coalport scale blue ground six piece dessert service, early 20th century, each piece painted with fantastical birds in landscapes to shaped reserves within gilt foliate cartouches on a scale blue ground. 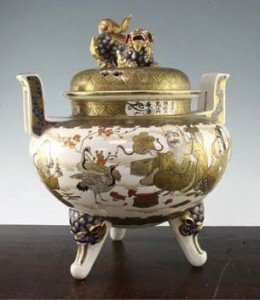 A Japanese Satsuma pottery large koro and cover, signed Gyokuzan, Meiji period, the compressed ovoid body painted with a the seven gods of happiness, animals and objects emblematic of them with diaper and brocade pattern borders, inscription to neck, the pierced dome cover with shi-shi final, six character seal mark to base. 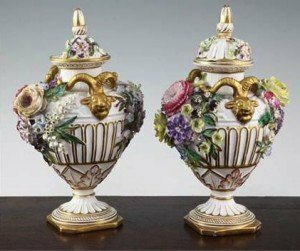 A pair of John Bevington floral encrusted twin handled vases, late 19th century, in Meissen style, with gilt ram’s head handles and profusely encrusted with flowers, gilt highlighted borders.